Remember that great idea for a google maps envelope from Beste Miray? 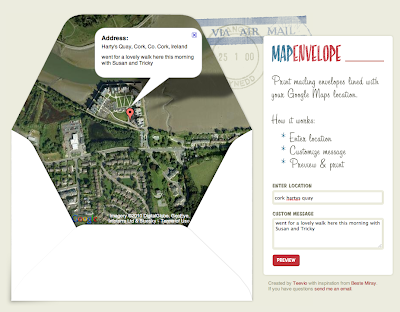 Well I'm delighted to see a site built around that very idea – you can now generate your own map envelope by simply inputting any location that google maps generates, and a template is generated for you to make your own li'l envelope. Now isn't that very neat?! Check out mapenvelope.com, built by tweevio. Baedeker – the first travel guides?